In his essay included in the booklet that accompanies the new Criterion home video release of Watership Down, Martin Rosen's 1978 animated film adaptation of Richard Adams' classic novel, animator Gerard Jones begins by noting that when the film was given to the censors in England for classification, the British Board of Film Classification gave it a "universal" rating, explaining that while Watership Down "may move children emotionally during the film's duration, it could not seriously trouble them once the spell of the story was broken." Jones then points out that he's been troubled by the film since he first saw it, at the age of twenty-one. I do apologize to Mr. Jones for lifting so heavily from his opening paragraph, but as he well knows he's getting at one of the central facts of Watership Down's legacy. In my experience, when someone wants to defend a work of art aimed at children that has been excused for being too extreme in its violence or dark subject matter, they will point out that this sort of extremity has been aimed at children for centuries, have you ever read the original Grimm's fairy tales? and so on, but often when presented with a work of art that really does push a child's buttons, that really does disturb and frighten them, to the extent in some cases that they actually never shake it, the defender usually, in fairness, won't actually turn hypocrite, but might find themselves genuinely shocked. And I don't think it's an overreaction to be genuinely shocked by Watership Down. The story, about a small group of rabbits led by Hazel (the voice of John Hurt) who flee their warren when the doomsaying prophecies of Fiver (Richard Briers) go unheeded by the chief rabbit and encounter many terrifying dangers on their way to finding a place where they can build their own warren, is a classic in many ways, not only because it is knowingly and brilliantly archetypal, but also because Adams' original novel (his first, published when he was in his early fifties) from 1972 was so good and such a massive success that it helped shape those archetypes for the modern world. It was also about rabbits, which, speaking for myself, made the young me view it as something wholly unique. No people anywhere! Almost! I'm speaking of course about the film here, which I loved as a kid and watched it God alone knows how many times -- I didn't read the novel until about a month ago, and until this past weekend hadn't seen the film in over twenty years. I'd long wanted to revisit it, but over the years I've shed most of whatever nostalgic instincts I might once have had; this has had the side effect of making me very distrustful of those things I loved in my youth, or distrustful of my taste, is I guess the more exact way of saying it. Then again, I also think culturally things are worse now than they used to be, a combination of attitudes which if nothing else makes room for more disappointment in one's life. But enough about me. Suspicion of nostalgia aside, like Gerard Jones and pretty much everybody I've ever discussed the movie with, I've always felt haunted by Watership Down. It's not merely that rabbits are violently killed in the film -- more than in the novel, which, somewhat counter-intuitively, is rather more gentle that Rosen's adaptation -- but that, like the book, while the story is certainly about courage, tyranny, adventure, community, and so forth, it's also not-so-secretly about death. Not as in violence, but as in dying, that thing we all do. This is transplanted by Rosen directly from Adams, and it's the whole thing, right there. It is, in essence, literally everything. What I'm stumbling around trying to get at is that if Watership Down occasionally seems pedestrian, and I would argue that it does, in these moments Rosen, for whom this was a dream project (he would make one other film, The Plague Dogs, another animated adaptation of a Richard Adams novel) was simply being practical because, resources being what they tend to be for dream projects, he had to marshal his forces. Soon he will introduce the wonderfully designed character Cowslip (Denholm Elliott, being typically excellent), the funny, eerie rabbit who will show Hazel and the others what a poorly chosen warren can lead to, or Kehaar (a manic Zero Mostel) their bird ally, and later, finally, the great villain, General Woundwort (Harry Andrews), as malevolent and frightening a creature as I think it's possible to create while still making it look like a rabbit. But the highlight of Rosen's Watership Down is a sequence that follows the wounding of Hazel by a farmer. Perhaps he's dead, the rabbits who had to leave him aren't sure, but they don't believe his chances are great. When Blackberry tells Fiver about Hazel, he presents it in a way designed to remove as much fear and sadness as it's possible to remove. "The Black Rabbit serves Lord Frith," Blackberry (Simon Cadell) tells him, "but he does no more than his appointed task." The title for this post, "My heart has joined the Thousand for my friend stopped running today," is the phrase the rabbits say over a fallen comrade; notice that the enemy becomes one's heart, because of the pain of loss. Not death. Death, in other words, is not the enemy. It's merely terrible. And none of this is just a nod towards artistry. It's not a self-contained idea that Rosen will discard for standard images of heroism (though they're here too, and they're great). We're being set up, as in reality we are constantly being set up, for the inevitable. Adams' novel is a great one, but in the final pages I could almost sense him thinking "Don't screw this up." The very ending of the novel displays the finest writing in its 500 pages, and Rosen was man enough to hold onto what Adams gave him. 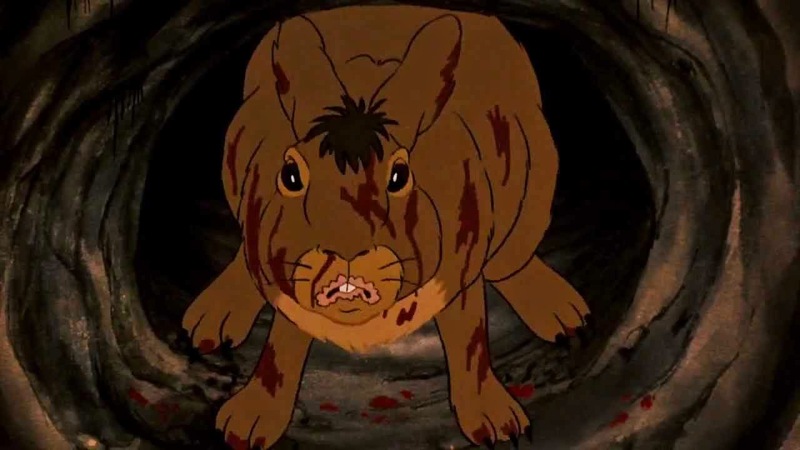 If Watership Down occasionally has a clumsy, jittery aesthetic as the pieces are being moved around, it's so that when it counts Rosen can build it up to be one of the great movies about death. It's okay if you're left seriously troubled by it. I watched this movie a number of times as a child. I remember being disturbed by certain parts, but also fascinated by the fact that here was a rare children's movie that was trying to get at something real, that was trying to do more than merely entertain an audience of unsophisticated brats. If only we had more children's movies that bothered to aim so high. God, it must be at least 30 years since I last saw this, but I still remember it fairly well. Even down to the quality of the art, which I think lent rough, almost rustic character and texture to the imagery. It might have been somewhat disturbing, but in a way that truly stirred a child's sympathies, rather than just provoking an occasional nightmare. I'm a little surprised to learn now that Zero Mostel had a part in this--just that by itself is enough to tempt me to look at it again. A lovely piece, all up, Bill.